Get Free Resources In Your Inbox! Depression, anxiety, and PTSD are some of the most common mental health issues mothers face. Unfortunately, and all to common, moms are so busy caring for the other members of a family that her own health (mental, emotional, and physical) can suffer. Mental health is nothing to set aside though. Moms need to know that it affects their every day, their thoughts, their actions, and even their families. If you or someone you love is suffering with a possible mental health issue, you will find this blog article helpful in clarifying the symptoms and strategies to getting back to good mental health. Now some might presume that I come at this issue from a counselor’s perspective. And while that is partly true, I feel no shame in admitting my own personal battle in recovering from anxiety, depression, and PTSD. These diagnoses are not a weakness. They are not a life sentence. They are not a definition of who I am. Rather, these diagnoses were a framework for understanding symptoms that affected my thoughts, feelings, health, and family. Understanding the framework for what I was experiencing then helped me address the issues with some clarity and direction. And now I can thankfully say that I have battled them hard and won! No one is immune from mental health issues. They can affect both young and old. It doesn’t matter if you are an introvert or an extrovert. It doesn’t matter if you are highly educated or uneducated. Mental health issues know no socio-economic boundaries. Mental health issues can happen to anyone. Get your free full size graphic by clicking here to join my newsletter full of tips and more! • Life Experiences—trauma, abuse, life stressors, etc. 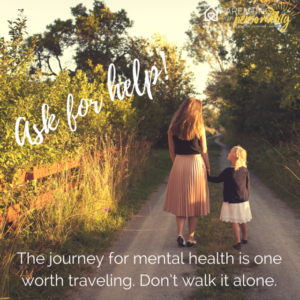 You might find my blog article written for Mental Health Awareness Month helpful, as it outlines some of the basics about mental health, symptoms, and ideas on getting the help you may need. That article contains a long list of mental health symptoms in general. In this article, we are focusing more on symptoms specific to the three things most common mental health issues with mothers—depression, anxiety, and PTSD. The Symptoms checklist download from last week’s blog post may be helpful in seeing the symptoms specific to each of these three. Sign up with this quick form to get yours in your inbox! Many people don’t know the symptoms related specifically to these three issues, nor how they might impact one’s life. In fact, many people that come in for counseling aren’t quite sure of the symptoms either. Then, when I start listing some common symptoms, they are surprised to find how many they can identify with. (You don’t have to have every symptom, rather a few that are impacting your life for some time.) I could recount to you numerous ways these symptoms impact one’s ability to mother if not addressed. But suffice to say that with treatment, none of these issues have to be debilitating or take you off your game! And I say that both as a survivor and counselor! There is a formalized depression scale that some doctors may use or even find online. However, if you report that you are experiencing a few of these and have been for some time, they will have a good sense if this is an issue or not. They may or may not use the scale. • Get good rest (especially during the hours of restorative sleep 3-7 a.m.), going to bed and getting up at a regular time and then taking a short nap if needed. • Find someone that you can share your struggle with. It feels really hard to connect with people when depressed. Whether you choose a friend, a professional or both, it is really important to be transparent and honest about your struggle. • Minimize your stress and ask for help. Even though depression is something that happens in the brain, it affects your whole system. Consider getting some help in order to lighten your load a little. • Don’t hesitate to see a professional who can offer counseling, treatment, coping strategies, medication, or a combination of these. Each person may feel different about using medications. You don’t have to use prescription medication if you are not comfortable with that. You may be able to get nutritional help, direction with supplements, or utilize other coping strategies. Seek the form of treatment you are most comfortable with. It is important to keep in mind that the sooner you treat depression, the sooner you can see results. Waiting for it to get worse may simply make it harder to treat. 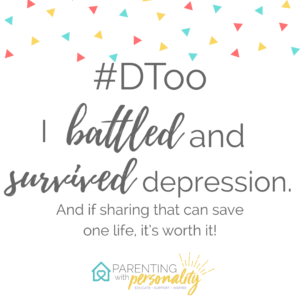 I shared about one of my journeys through post partum depression in this blog post a few years ago. Dr. Christina Hibbert shared numerous stories of those who had experienced depression and anxiety. You might find it helpful to refer to other’s accounts to know that what you are feeling makes sense and can be helped. I often say that depression and anxiety are close friends. Why? Because you can often experience them together. If anxiety is affecting your everyday functioning, you can get help and feel some relief. As odd as it may sound, some people feel anxious about feeling anxious. And that is a real symptom. The symptoms listed above can really affect one’s ability to live, parent, and enjoy life. But it doesn’t have to be that way. Anxiety left untreated tends to grow and start affecting more and more areas of life and relationships. • Get a clear understanding of your anxiety both what triggers it and what works to ease the effect or response. Even write down some things you notice that precede your worst anxiety responses and what tends to work when you calm yourself down. • Work to become healthy in your thinking. While anxiety can take you off course, having a healthy point to reset to is a great benefit. This will help you regroup faster and more effectively. 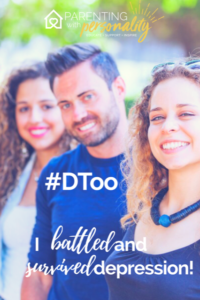 • Share your struggle with someone else (whether a friend, a professional, or both). Having someone to help give perspective and be supportive when things get tough is essential. A professional can help you address the most effective ways to find relief (medication, supplements, counseling, etc.) that you can be most comfortable with. Again, this is not a condition that needs to control you or your life. There is help available. You can feel relief and healing. The following ideas might be helpful as you seek treatment for your PTSD symptoms. • Share about your experience. Talking truly is therapeutic. Each time we share about something that we experience, our brain begins to store it in different areas, away from the emotion and more as factual. So whether you share with a friend, a professional, or both it will be helpful in your recovery. • Understand your triggers. There are generally certain sights, sounds, locations, sensations, or experiences that can set off the physiological responses to anxiety. Keep some record of those so that if you see a professional, you can relay those things that are hard to make sense of. • Develop strategies to calm yourself when the episodes occur. These may involve some of the same things mentioned above for anxiety in general. And a professional can help you try effective strategies for your situation if needed. • Look into specific strategies of treatment that might be most helpful or comfortable for you to pursue and decide if one of those might be worth discussing with a professional (ex: EMDR, Tapping, Exposure, Medications, etc.). A professional will have ideas in mind if you are unsure. It is key to know that you can get better. As someone who has survived these journeys, I can tell you it takes some work. But it can and will happen! Life on the other side of these struggles can be good again! • Asking for help and reducing stress. I had someone come in and help do some cleaning and house tasks once a week during my darkest times. I also had to be better about asking my husband to give me some breaks so that I could reset or refresh. I couldn’t wait for him to do it, but I had to learn to ask specifically for what I needed him to do. • Counseling: Both individual and marriage counseling can be very beneficial when going through times of trial or transition and this was no exception. Remember, counseling is NOT a last ditch effort, it is a tool for resolving issues and finding helpful strategies for change. • Finding those things that bring you peace amidst the chaos. For me, this was making sure I stayed connected with my faith. I had numerous index cards with verses of encouragement and hope spread across the house. 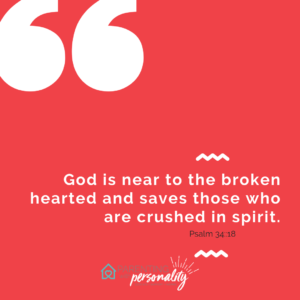 Keeping those healthy, hopeful words prominent in my sight helped me reflect on things that were effective in helping me get to a better place mentally, emotionally, physically, and spiritually. When my mind was too overstimulated for worship music, reading long text, or concentrating on even a short devotional, I utilized simple prayer and reading those verses on the cards. And often times, those prayer times were just crying out “HELP” to God. He can hear it all and loves us all the same. • Sharing the struggle with key people in your life. This was important, as I needed to have those who were close enough to see when things were getting worse or if I was unable to see things on my own. Another set of eyes during these dark times can be a matter of safety. When our minds are not well, we can miss things that are important. Learning to trust those who love you and what they are seeing or experiencing is very important when our mind can do tricks on us. • Working with a medical doctor or natural doctor to figure out what supplements or medications can bring some relief. I have been on both sides, fighting depression with natural means and then resorting to meds when necessary. Again, there is no shame here. Each person will have their own thoughts on what they are comfortable with. The journey through depression, anxiety and PTSD can be long and difficult. Fight hard. Getting better is work but so worth it! You may, after reading this article and looking through the symptom list, decide that you would benefit from finding a counselor. You might find this past article helpful in doing that. Please remember, you can only give as a mom, what you have inside TO give! It is not selfish to take care of your mental health needs. Not only do you benefit, but your child and family will benefit as well. Don’t be afraid to reach out and find help. This week marks the World Mental Health Day and National Depression Screening Day. 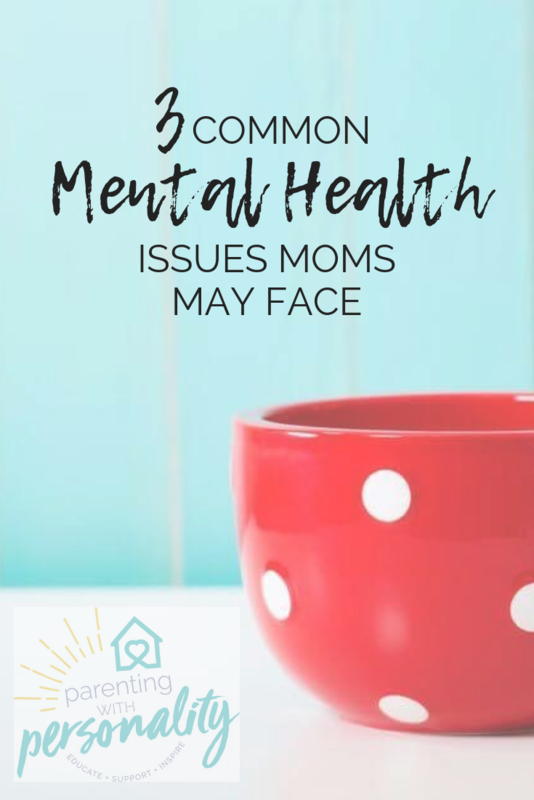 So hopefully, you have learned a bit about these three common mental health issues moms may face. Whether you or someone you love is experiencing these symptoms, please know there is help. If you are battling one of these, please know you are not alone. I truly understand. If you ever need an ear, a shoulder, or just someone who “gets” it, please feel free to contact me. All my contact information is available here on my website. I care. 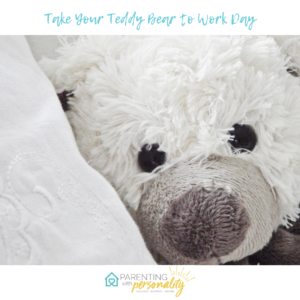 Now, you might also like to know yesterday was Take Your Stuffed Animal to Work Day, it happens every second Wednesday of October. Although it may have passed us by, you can save the date for next year! So if your heart feels a bit heavy after this topic, it might be a good excuse to go buy that comforting soft bear and enjoy the lighter side of life! This might even be a fun way to celebrate with your child! Laughter is good for the soul like medicine! Sign me up for the newsletter and send me my free resources!